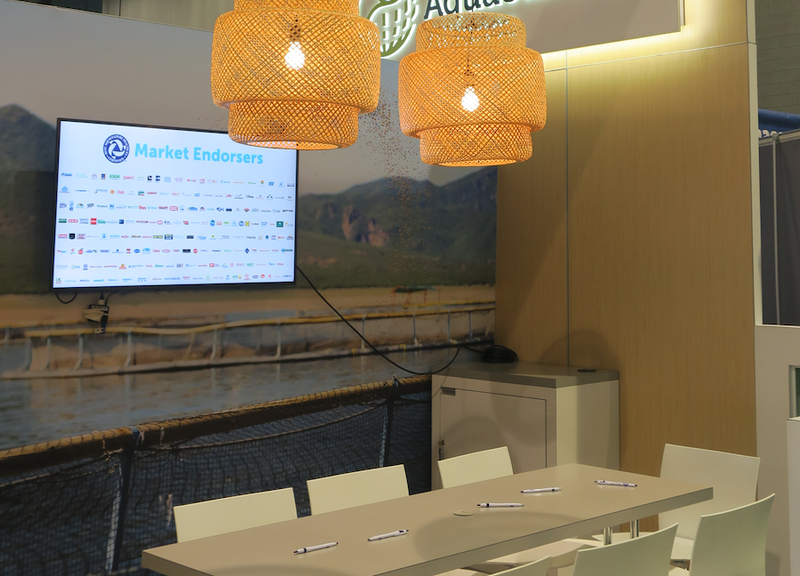 GAA unveiled a new booth at SENA this year, featuring a more open layout with larger meeting rooms. 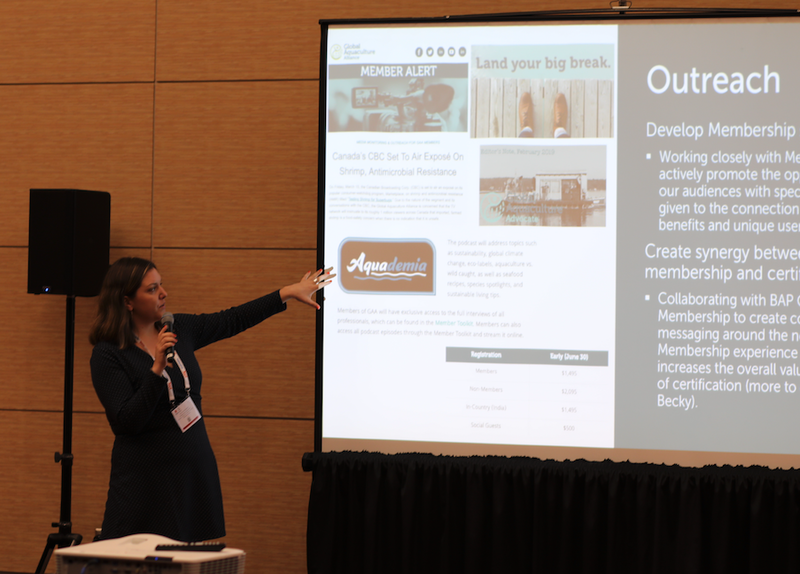 GAA Marketing Director Devan Meserve speaks at the GAA Stakeholder Update meeting. 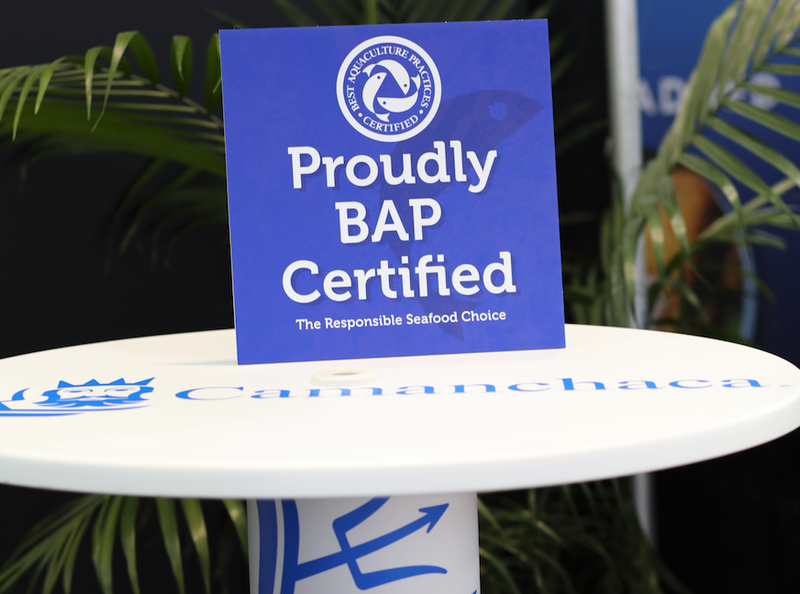 It was easy to find the BAP logo on the show floor at SENA 2019, like on these samples from Open Blue Cobia. Marine Products Export Development Authority (MPEDA) Chairman K.S. 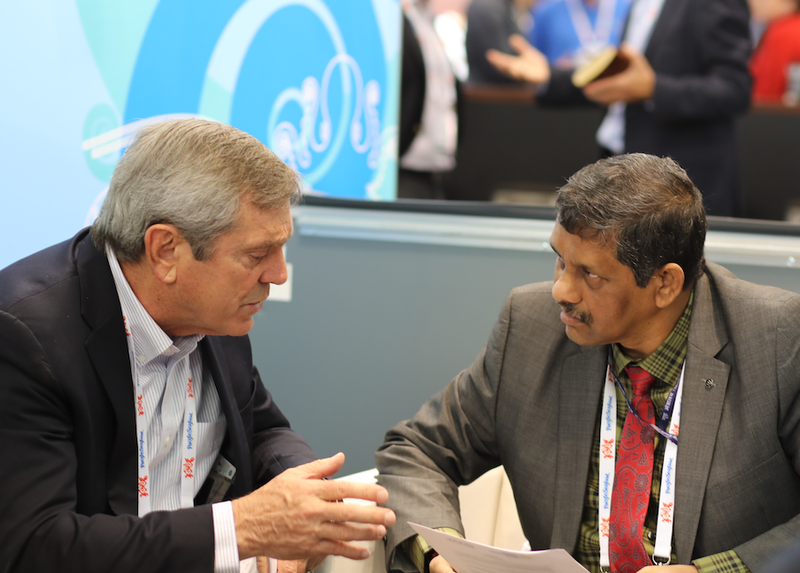 Srinivas (right) was among the dignitaries in attendance at Seafood Expo North America 2019, and GAA capitalized on the opportunity by meeting with the chairman to discuss GAA’s annual GOAL conference, which this year is being held in Chennai, India, from Oct. 21 to 24. GAA President George Chamberlain (left) led the discussion. 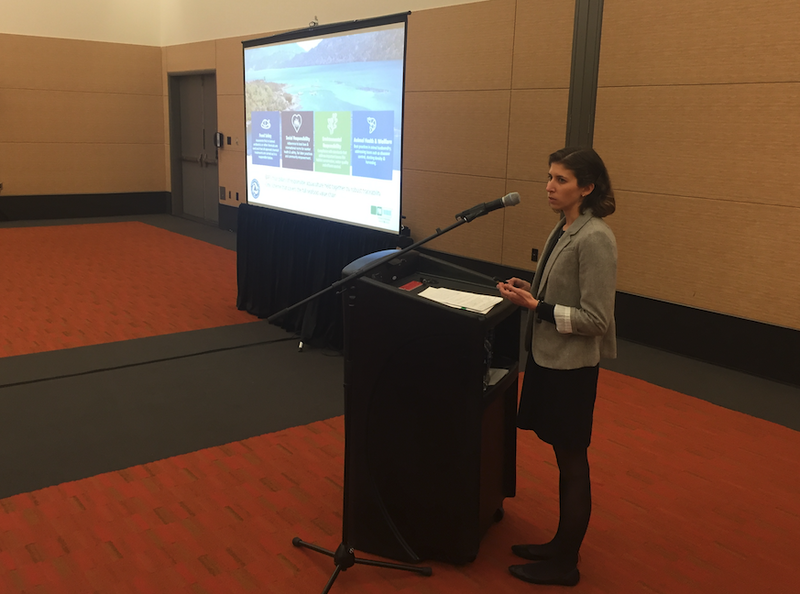 BAP Corporate Responsibility Manager Avery Siciliano was among the speakers at the Food Marketing Institute’s (FMI) Seafood Strategy Leadership Council on March 16, just prior to the start of Seafood Expo North America 2019. 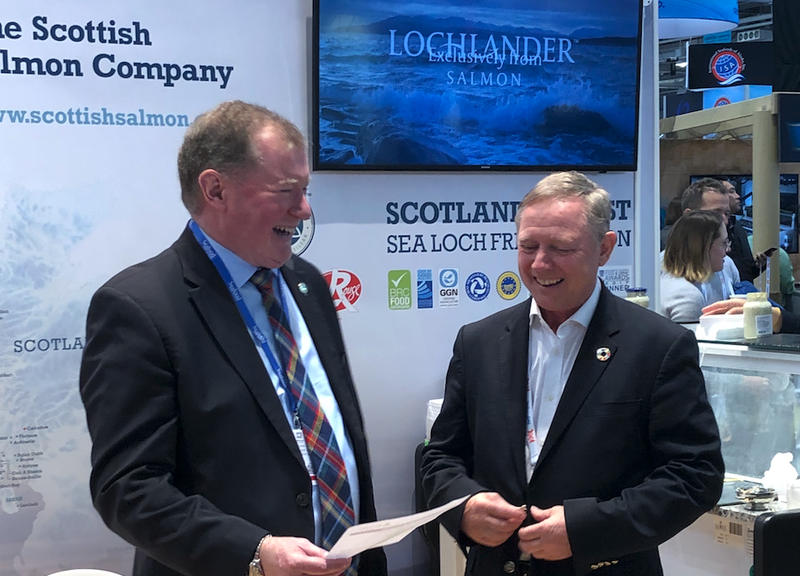 Craig Anderson (left), CEO of the Scottish Salmon Company, celebrates attaining BAP three-star certification with Mike Berthet, BAP's market development manager for Europe. 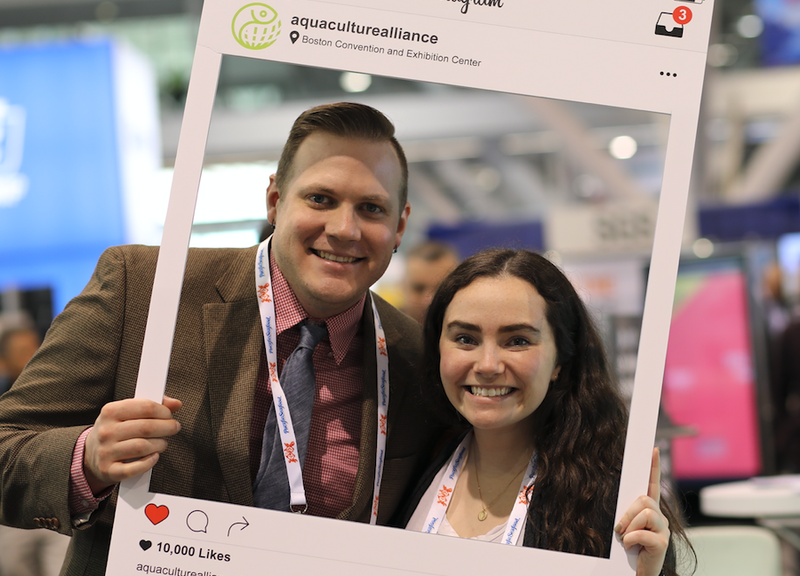 GAA's Shaun O'Loughlin and Maddie Cassidy use the GAA Instagram frame at the booth. BAP-certified exhibitors at SENA used "Proudly BAP Certified" signs to show their support for the program, like this one at the Camanchaca booth. 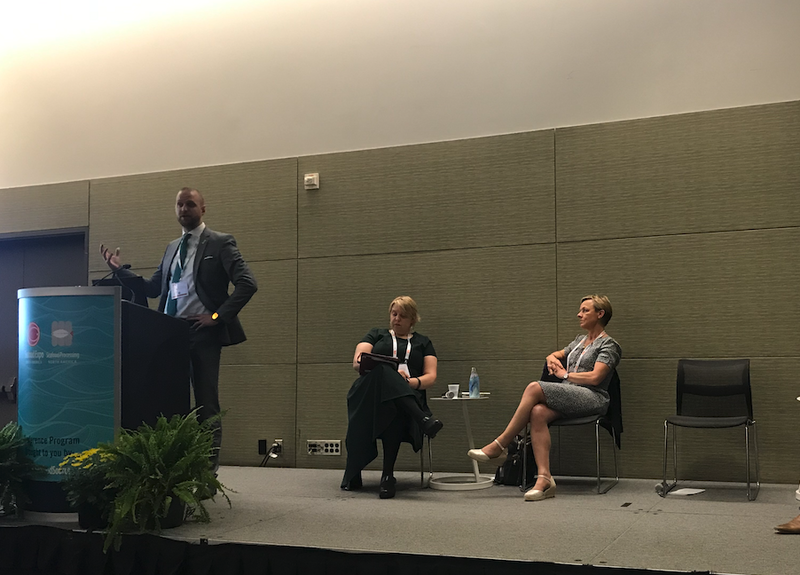 GAA Director of Strategic Engagements Melanie Siggs speaks as part of a panel discussion titled "How do we grow safe and sustainable aquaculture for all?" The event was part of the conference program. 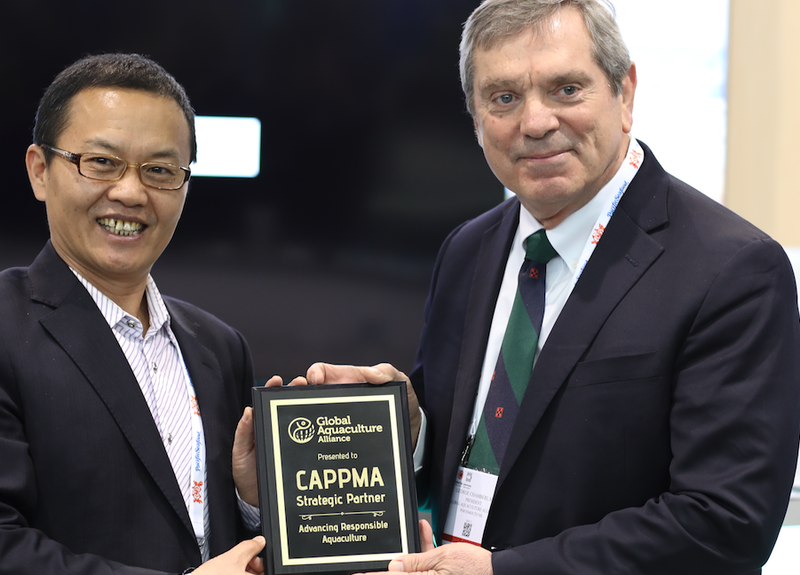 GAA President George Chamberlain presents Dr. Cui He, president of the China Aquatic Products Processing and Marketing Association (CAPPMA), with a plaque to celebrate their strategic partnership with GAA. 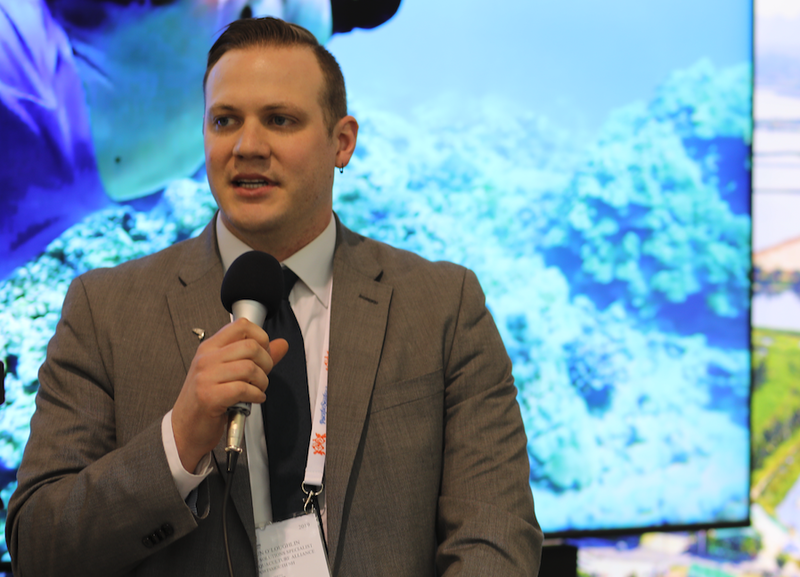 GAA Executive Director Andrew Mallison introduces the new GAA Aquademia Podcast on Monday at the GAA booth. GAA's Shaun O'Loughlin speaks about the new Aquademia podcast. 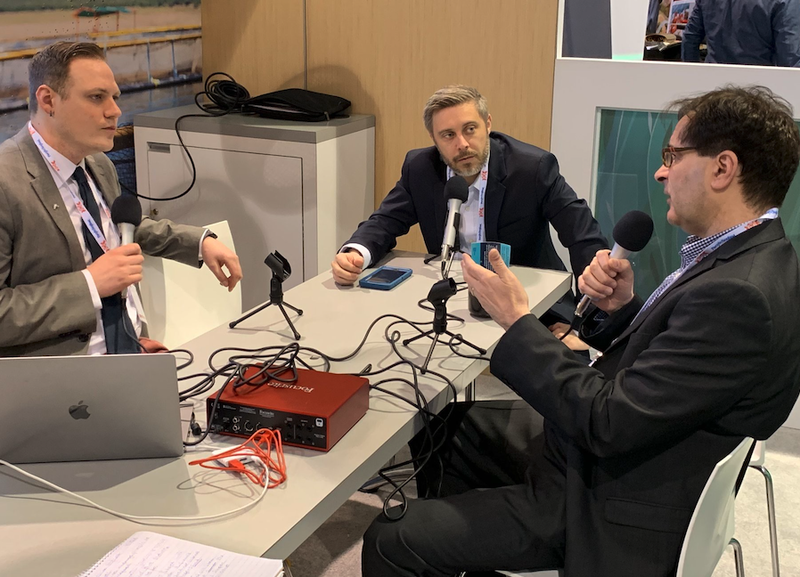 GAA's Shaun O'Loughlin (far left) and Justin Grant record an Aquademia podcast episode with Karim Kurmaly, CEO of Veramaris (right). 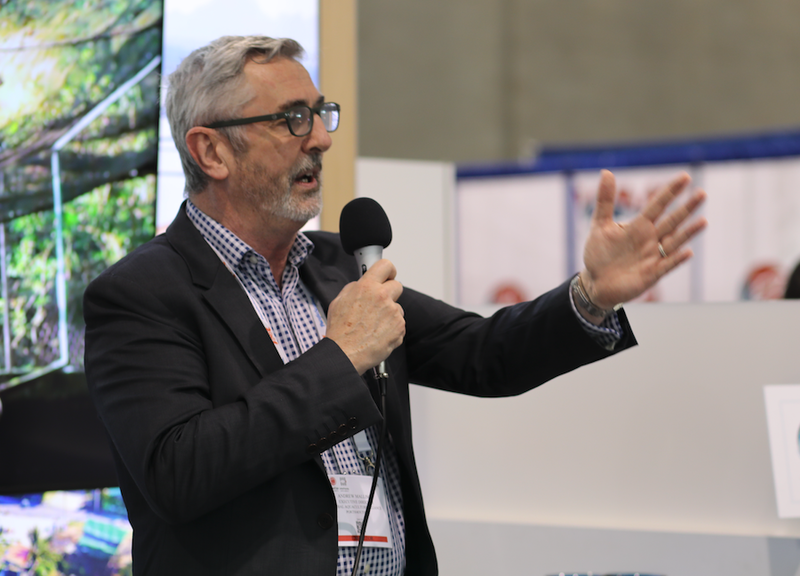 On the final day of SENA 2019, GAA led a discussion on farmed shrimp as part of the conference program. Titled the "Annual Shrimp Forum," the discussion featured GAA President George Chamberlain and was moderated by GAA Communications Manager Steven Hedlund. 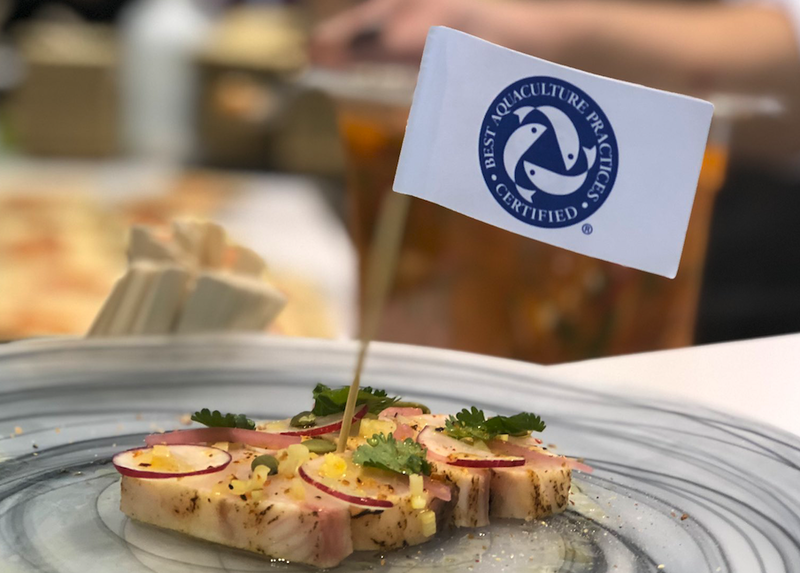 Once again this year, the Global Aquaculture Alliance (GAA) exhibited at Seafood Expo North America (SENA). 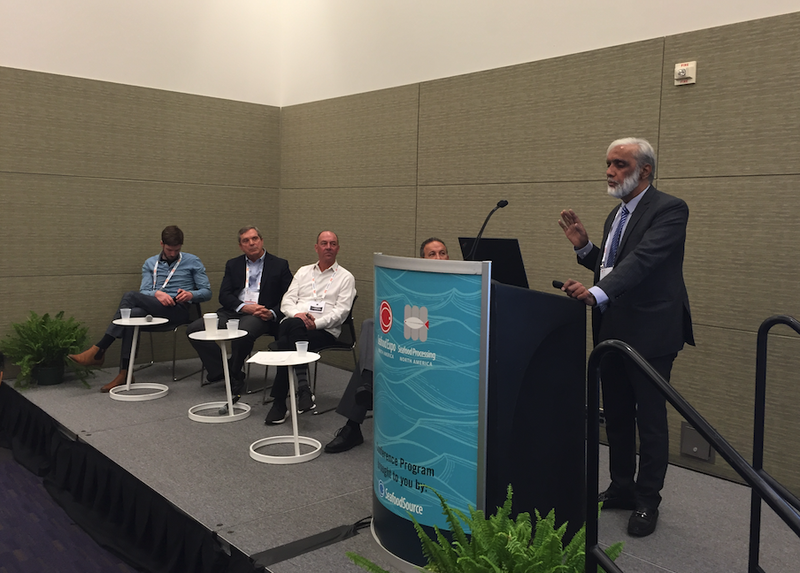 The 2019 edition of SENA — North America’s largest seafood trade show, with more than 1,340 exhibiting companies from 50-plus countries — took place at the Boston Convention & Exhibition Center (BCEC) in Boston, Massachusetts, USA, from March 17 to 19.